St. Antony’s Kitale’s Under-16 team, nicknamed ‘little Barcelona’ progressed to the National Secondary School Games semi-finals after a 2-1 win over Kinondo from Coast Region on Wednesday. The win saw George Owoko’s charges move to six points after two games and assure themselves of a last four slot and will only need a draw in their final group match on Thursday to confirm their place as the topping team from Pool B.
Captain Cedric Muchina scored a thumping stoppage time winner to seal the win for St. Antony’s Boys. Ansar Shamun had broken the deadlock for the solidarity boys in the 55th minute with a low effort but the same was cancelled out almost immediately from the penalty spot through Hassan Kombo after Christopher Raila handled inside the box. For their seniors, the Under-19 boys, a place in the semi-final will be dependent on the result they post against Kathungi Secondary on Thursday after a late controversial penalty saw them play to a 1-1 draw with favorites Kakamega High School. St Anthony’s were trailing by a solitary goal before a controversial penalty was awarded to them four minutes form full time. Daniel Musamali was brought down by Collins Sichenje off a swiftly executed counter attack and the referee pointed to the spot though the offence looked to have happened outside the box. Moses Mudavadi stepped forward and converted the spot kick cancelling out Evans Odhiambo’s early goal. Odhiambo shook the net in the third minute after racing to a rebound poking it home after the keeper spilled a freekick. Meanwhile, Dagoretti High School from Nairobi boosted their hopes of qualifying to the semis after beating North Eastern’s Tarbaj 9-0 to move to four points. 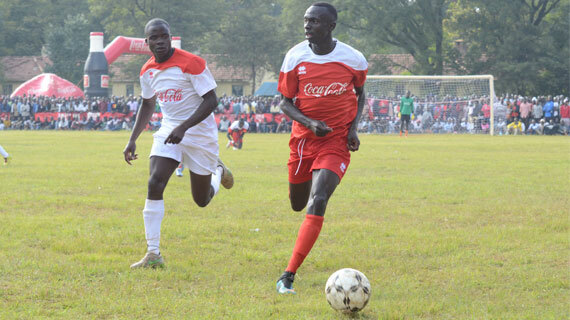 They play Shimba Hills on Thursday with the Coastal team also on four points after playing to a 1-1 draw with Olbolosat. In other results from Wednesday’s games, Girls Under-19 Champions Wiyeta Girls face the possibility of an early exit after they were handed a shocking 1-0 defeat at the hands of Kwale Girls. Captain Koko Elizabeth’s first half goal was all Kwale Girls needed to shock the defending champions. This leaves them with a must win match against Arch Bishop Njenga today, the Central Region team already assured of a semis slot after back to back wins. Kwale will be facing the group’s punching bags Matuu in their final group match. If Kwale beat Matuu and Wiyeta drop points against Arch Bishop Njenga, then the defending champions will be out. A win for both sides will see the second placed team decided on goal difference with Wiyeta having beaten Matuu 11-0. For their Under-16 team though, it was a contrasting result as they sailed through to the Copa semis after beating Sega Girls 2-0. They had earlier beaten defending champions Olympic 5-0 in the opening game on Tuesday. At the same time, the Rugby Sevens competition will kick off on Thursday and a new champion is expected with holders Menengai High School having been dumped out in the regionals.